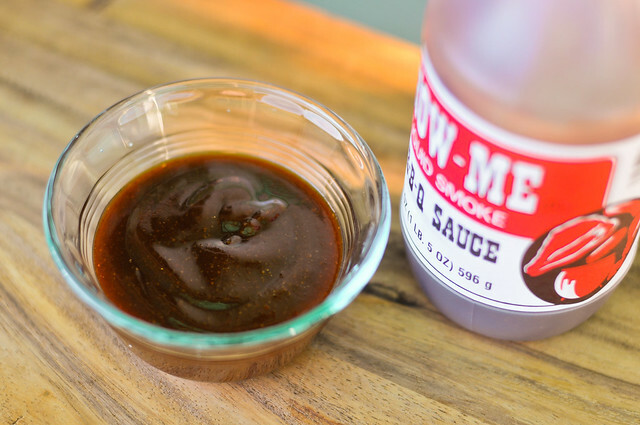 A liquid smoke sauce that surprisingly finds a great balance between sweet, smoky, and tart to make and overall very robust and flavorful sauce. This was the second of two sauces generously sent to me by Meatwave fan Betsy. While the first, Spicewine Ironworks Blue Collar, looked legit, I was dubious about this sauce, which had a very homemade feel to it, down to the lid that was taped shut. Turns out I was right with the homemade, but off with questioning the sauce that lay inside. 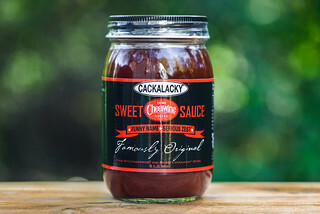 This sauce goes way back, started in 1975 by Harry Berrier of Columbia, MO. He developed the sauce to solve the problem of not being able to get a good sauce off the shelf, and after a strong response from friends, set-up shop in his basement, where the sauce is still made today. Having a background in veterinary pathology, Harry used his science knowledge to develop a sauce with a perfect PH balance to prohibit growth of bacteria, making it completely shelf stable. Still going strong today, 37 years later, he has a developed a dedicated and diverse following for his sauce—available mainly in local groceries and by phone orders—while still staying small. There's no mistaking the liquid smoke in this sauce, which is the first and last things you smell when taking in a large whiff. While the smokiness is strong, it's not pungent, with a hefty sweet ketchup keeping it at bay. There's also a second billing of Worcestershire, which hides behind the smoke, but is still easily discernable. This burnt red, medium thick sauce is smooth with a syrupy consistency. It flows in a slow, but steady stream off a suspended spoon, with a fair amount of sauce left coating the spoon in the end. There are a lot of visible spices in this sauce as well. I fear liquid smoke, but somehow this sauce has been able to hit that note heavily, while retaining a smooth flavor. Sweet, tart, and smoky are the up-front flavors here, all which work together in a great balance that's consistant from start to finish. Towards the end, the tartness does start to be more dominent, and this is where the chili powder and garlic comes in, leaving a spiced taste that isn't hot. All of the flavors of the sauce held up on the grill, as it baked in well and then beautifully caramelized, leaving one pretty piece of chicken. The sauce added a robust flavor that was mainly sweet and smoky, with the tartness easing its way in a little. Overall, this sauce created one flavorful barbecue chicken. Dubious about the packaging, and fearful of anything with liquid smoke, I was taken aback with just how much I ended up enjoying this sauce. 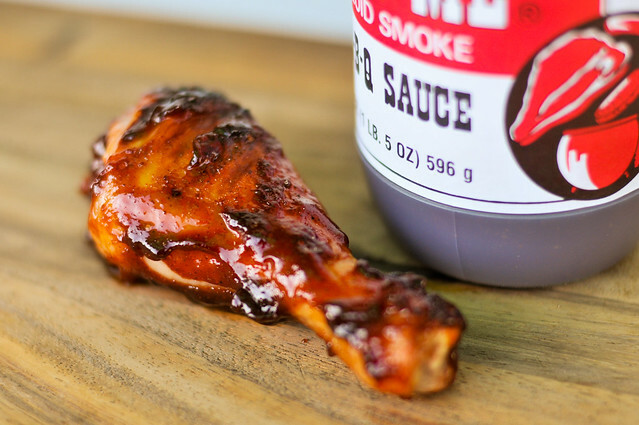 Yes, the smoke flavor is strong, but it's not pungent like many liquid smoke sauces, and strikes a great balance with the sweet ketchup and complex Worcestershire. It was great on chicken, but could do so much more. The bottle suggests it on hamburgers, roasts, and meatloaf, so those are some good places to start. Very surprising rating. I read the post title in my reader and clicked on the link thinking you were joking around. I was surprised it was a real sauce and that you actually tried it, given the name. Even more surprised with how well it turned out. I have never been a fan of liquid smoke. I find it dominates the flavour profile of almost anything and has an artificial taste. But, since you seem to feel similarly and you still liked the sauce, it makes me intrigued. That drumstick looks good I will say! OK, I live in Missouri and have seen this sauce around. 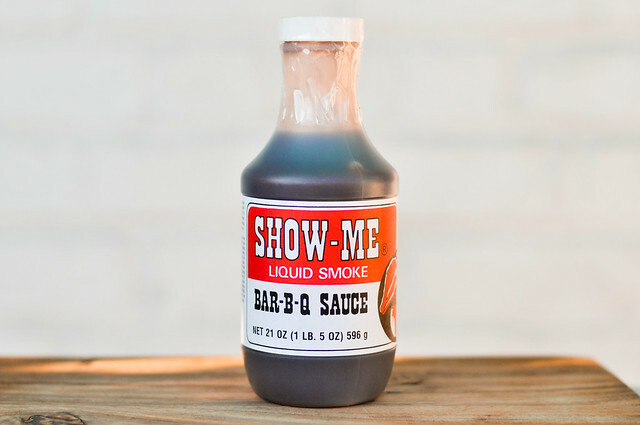 Now I am curious, always been afraid because of the name "liquid smoke" in fact if it were me I would have never put that on the label so prominently displayed. Thanks for the review, now I gotta try it and get back to you. Been having it shipped to me by the gallon for a few years. Let it sit on whatever on the grill to sit and thicken and flavors intensify. Ribs, chicken, awesome. this stuff is also great as potato chip dip. Grew up with it. Well as I posted in Aug I would give it a try and I must say it is VERY good. I don't normally go for a lot of sweet sauces but I really like this. It is a bit pricey where I get it so I will look for another bottle or two when I am in Columbia Mo at the grocery. I would recommend it on Ribs and Chicken. Too sweet for Pulled Pork or Brisket - Just my opinion however. I'm a huge fan of bbq sauce, and I love trying different ones out. This one sounds pretty interesting. I don't mind liquid smoke, but if there is too much it can really overwhelm whatever you add it to. I wouldn't mind giving this one a try though. It looks pretty good on that drumstick! Harry passed away last year but his wife and daughter picked up production. they make small batches once a month. The sauce has become "viral" here in Sweden. there is a small hot sauce/bbq shop i gothenburg who imports the sauce by themselfes. It sell out within a day or two every time they get a shipment. if you get ahold of a bottle, keep it like gold. My best friend went to college in Missouri in the late 70's /early 80's. We've been using the sauce ever since. I used to run a video store and we sold it in the store. Yeah I know bbq sauce in a video store? Well we liked it and used it and told our friends about it and it just went from there. Buy it by the case in the small bottles so you can use some, give some as presents, and of course hide some away for emergencies. It does not have to go in the refrigerator as the Ph allows it to be stored in a cabinet. It will slowly go really dark if you don't refrigerate but it will still be good. He makes it mild on purpose so you can add your own heat if you'd like. And the Show Me Meatloaf is excellent. I used to get this sauce from my boss back in Michigan, all of us were so addicted to this stuff. It has been about 10 years since I have used this product. I must say the flavor is just right and if you order a gallon you don't need to worry if you have room in the fridge because it is shelf stable as well as delicious. Great stuff going to place an order for sure. 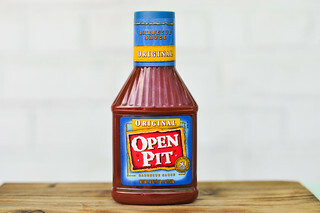 I somehow came across this BBQ sauce in the late 1980's (available by mail order) had it shipped out to CA by the gallon, and used it ever since until I ran out and couldn't remember the exact name or where to get it. Hands down, it's the best blend of flavors in a BBQ sauce I've ever tasted. I was sad when I ran out of it several years ago, and thought I'd never find it again. I'd wondered if Dr. Berrier had passed away and it was no longer in production. However, just ran across Dr. Berrier's business card, a Facts Sheet about the BBQ sauce along with two articles: one from the St. Louis Post-Dispatch Magazine, Sunday, Aug 28, 1988 and another from The New York Times, Wed. Sept 24, 1986 with a recipe for Show-Me Bar-B-Q Meat Loaf in an old file and decided to look online to see if I could find it. What a delight to have found it again, and know that it's still available. I'm going to order some post haste!! I am from Missouri and have been using this sauce since the 80's. It is just as discribed above and is the best sauce you'll ever put in your mouth. It is best grilled on meat for a few mins. Rather than putting on after the food is done. 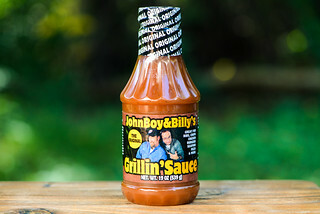 Wonderful on rib or chicken.. Makes fantastic bbq beans. Great for gift baskets or just a housewarming gift. This is a "must try" sauce. We buy in gallin sized jugs and keep in the pantry. It will keep just fine for months. I've been cooking with it for 25 years. Deeeeeeelicious!!!!!!!! Lasts for years too. Fantastic on ribs. I've tried many others but nothing compares to Show-Me. I have been ordering this sauce from California since the late seventies, almost forty years now. My brother found it and turned us on to it. I always enjoyed calling the company/home and talking to either Lina or Harry. He would tell me that my name was just like his wife's only I had a "D" in mine. Too funny. One time I called in an order and Lina was kind of upset because Harry had just purchased a conveyor belt so he could get product up from the garage easier and she was guessing that it meant he was not going to retire soon! HAHAHA! The idea that they do business without charging up front is amazing and really makes me feel good and trusted. Shipping and billing all over the world, Harry said his losses were only about two percent over all of the years he had been doing business and besides, "it made it a better price for his customers! Get creative and add your own ingredients to this sauce like any and all types of alcohol, jams, garlic, onions, peppers, spices etc. Have fun and Enjoy !!! The best! This stuff is great. My friend Mark brought some back from college in Missouri back in 1981 and we've been using ever since. Rich smoky and tangy. Show me meatloaf - delicious. Great on wings. Wait until the end because the sugar will burn. Turn down the heat when wings are done and then baste and turn and let it brown just a bit, flip it and do the same on the other side. Wow. One of our best sellers, Come and get it. We have a new version called "Show-Me Some Heat" if you like to spice it up a bit. Just like the good ole days, we'll put the invoice in the box and ship in advance!